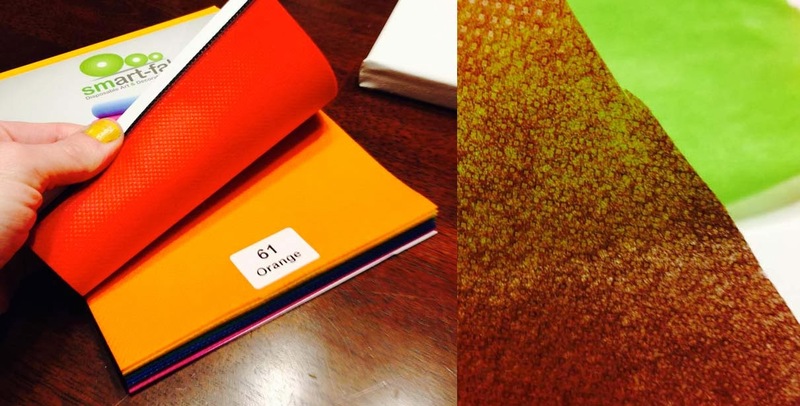 Andrea and I spent an evening playing with the Smart-Fab color swatch book, which let us see all 15 assorted colors and get a sense of the texture. We were both impressed how bold and bright the colors are (there are a few more subtle shades to pick from) and the unique, lightweight texture of Smart-Fab. 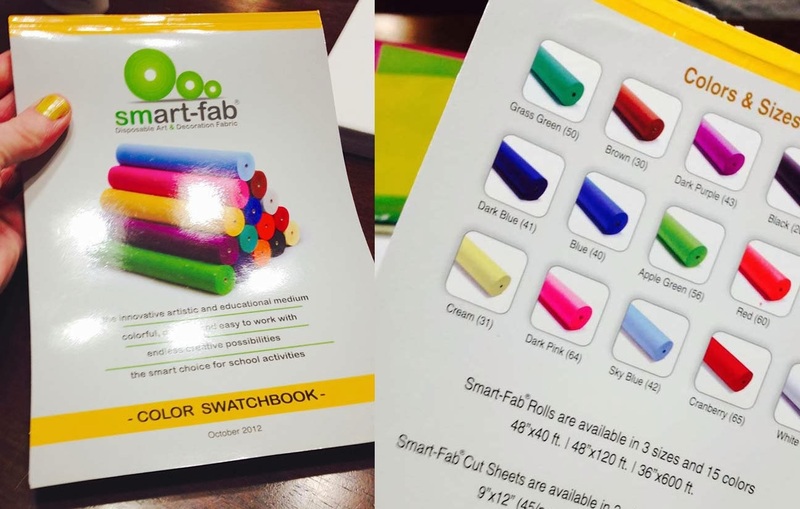 Smart-Fab offers 45-pack sheets in 2 sizes and 3 color variations: 15 assorted colors, black, and white. You can also buy it by the roll in 3 sizes and 15 colors. Rolls are great for bulletin board backgrounds, table covers, and large banners. The smaller sheets are perfect for smaller projects, like flowers, bugs, and backgrounds for the alphabet and numbers. I downloaded a few project ideas from the Smart-Fab website and their Pinterest page and saw that Smart-Fab can be painted, drawn on, stapled, glued (use fabric glue), and taped. Below, you can see where I used a Sharpie to sketch the outline of a butterfly, and using paint dappers, with blue paint on a brown sheet of Smart-Fab. You can definitely draw and paint on this stuff, but be sure you have something underneath when using paint because it will seep through. 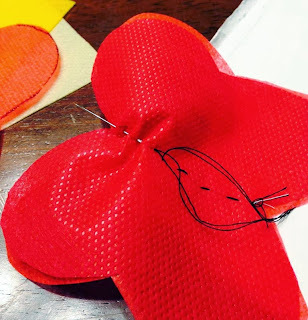 For the first project, I made a small butterfly with two shades of red for the wings and yellow for the body. I really appreciated how detailed the sample project ideas are. Definitely visit the Smart-Fab website if you are looking for creative ways to use this product! Unlike paper, Smart-Fab was quite easy to sew. I'm quite good with a machine, but not the best at hand sewing, yet did just fine with my butterfly project. You could easily make a bunch of cute flowers and butterflies and tack them to your classroom bulletin boards for seasonal decor, or plan a craft project with the kids to decorate their play area or bedroom! You can see above, Andrea's having fun cutting Smart-Fab pieces to make a flower. She's probably not thrilled I posted this, but I wanted to show how vibrant the Smart-Fab colors are. 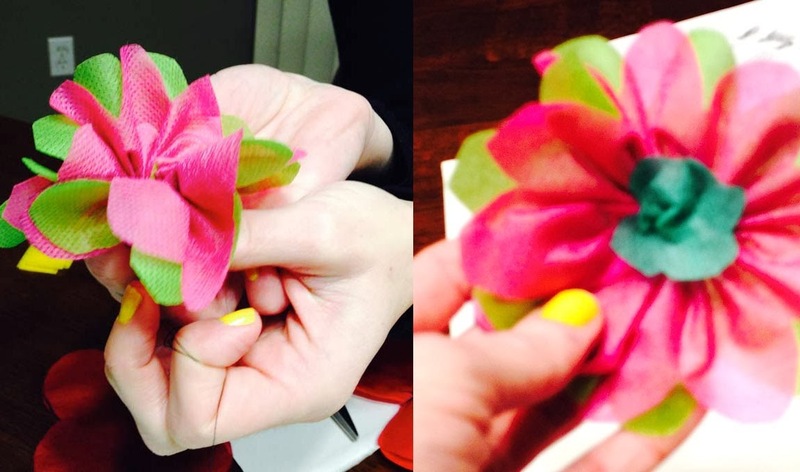 Check out this neat flower Andrea made! It wasn't difficult at all and reminds me of those paper flower parasols I used to make as a kid. 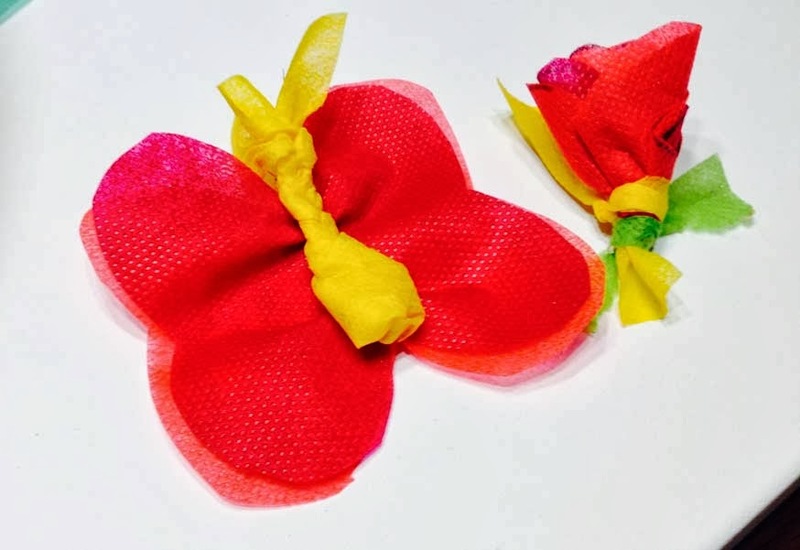 With large rolls of Smart-Fab, you could easily make huge flowers, or use the smaller sheets to make cute little flowers to use as a boutonniere. Smart-Fab gave me three sample rolls to give away to one lucky blog reader. Each roll is 24" x 10'. The winner will get dark blue, dark purple, and grass green. This giveaway will run until January 6, 2014. Please feel free to spread the word about this giveaway, especially to anyone with an interest in crafting, art projects, and definitely teachers! This giveaway is open to US residents over 18. A winner will be randomly chosen by Rafflecopter. The winner will have 48 hours to respond to the announcement email or a new winner will be announced. The giveaway prize is sponsored by Smart-Fab. For more information about Smart-Fab, check out their Facebook page. They often have product giveaways! FTC compliance: While I did receive product samples at no charge for review purposes, I was not compensated for this post and all opinions are my own. This event is in no way associated with Facebook, Twitter or Pinterest.